Homemade chocolate pudding in a graham cracker crust – chocolate pudding pie just like mom always used to make it (but homemade)! Sorry for (in my mind, heart, and soul) promising you a salted caramel pie today. Sorry for trusting a certain foodie magazine and not my gut instinct when it told me to pour liquid gold (aka sweetened condensed milk) into a glass pan, cover it tightly and then bake it for two hours so that it could turn into smooth silky almost burnt sugar gold. Sorry when it all turned to chunky beige mush instead. I would show you a picture, but the.boy actually LAUGHED AT ME when he saw it. Then he looked at what it was suppose to look like in the magazine and he laughed more. Then he looked at the pan again and gagged. I just can’t put you through that kind of emotional rollercoaster. Would I do it all again just to end up with this chocolate pudding pie in my life? Hands down. Absolutely. Without a doubt. Yes. I actually grew up eating chocolate pudding pie at Thanksgiving every year, but when my mom made it she would use a premade crust and pudding from a box. Don’t get me wrong, it was AMAZING, but that kind of semi homemade thing just doesn’t jive well with this everything-from-scratch vibe I’ve got going on. So when I found myself with an empty pie crust and nothing to fill it with…I knew what I had to do. Chocolate pudding pie. Or bust. And in about 10 minutes, I had a chocolate pudding filling on my hands. That’s seriously quick it was. I’m pretty sure the boxed stuff actually takes LONGER than that. I am never going back to my semi-homemade ways. At least, not when there’s rich decadent just-like-your-momma-made-it-but-better pie to be had. So….it is the LAST.DAY.OF.PIE.WEEK. And I am kind of beside myself. Can I just bake pies all of next week too and we’ll just call it pie week squared? Or are you guys sick of all the butter and sugar? I hope not because there is a lot more where this came from in the next few weeks. So get your stretchy pants ready. To see our beloved confections out, we hosting one last CRAZY giveaway! This time one lucky person will be winning a 13 Cup KitchenAid food processor!! I have one of these and could not make pie crust without it. It’s non-negotiable. And crazy fabulous. See details for how to enter below! 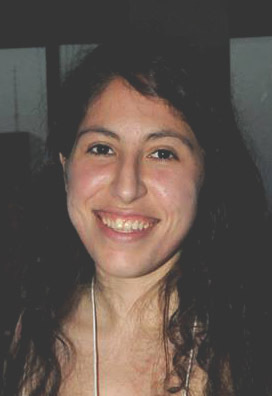 And make sure you check out these awesome posts from my fellow #PieLadies! Homemade chocolate pudding in a graham cracker crust - chocolate pudding pie just like mom always used to make it (but homemade)! In a large bowl, combine the graham cracker crumbs, brown sugar, salt, and melted butter until they are well mixed. Pat into a 9-inch pie pan. Bake for 10 minutes, or until set. Set aside to cool. For the filling, whisk together the cornstarch, ⅓ cup sugar, cocoa powder, and salt in a heavy 2-quart saucepan. Gradually whisk in the milk, making sure to mix in the dry ingredients in the corners of the pan. Bring to a boil over medium heat, whisking constantly, and then boil for 2 minutes, still whisking, allowing the mixture to thicken. Remove from the heat and whisk in the chocolate and vanilla. Pour the filling into the shell and cover with wax paper or plastic wrap that has been sprayed with cooking spray. Let chill for at least 2 hours. Just before serving, beat the cream with the remaining 2 tbsp of sugar until it holds firm peaks. 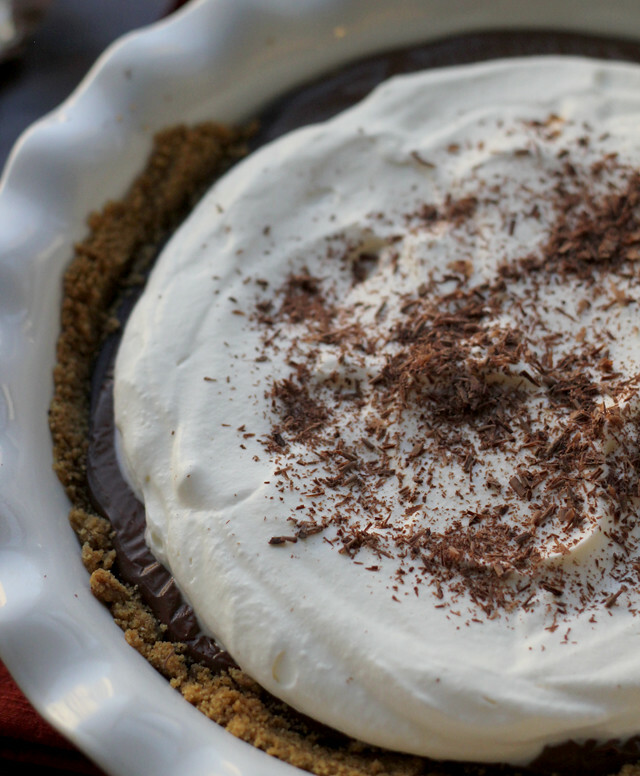 Spoon onto the pie and garnish with chocolate shavings. I am so glad your other pie didn’t turn out, because this one looks heavenly. Seriously, I have to got to make this pie. And I can’t think of anything better than pie week squared. This reminds me I haven’t made choc pudding pie in ages. It’s a sure winner! I hope you were able to save the pan! I hate it when recipes haven’t been tested properly. I hate trying a new recipe only for it to be a bomb…such a waste BUT this pie looks worth it. I’m saving this one and making it for my non vegan family!!!! They all love chocolate pie! Debbie, I’m betting you could make it with coconut milk or almond milk and coconut whipped cream for a vegan option!! Salted caramel pie sound delicious….i’m sure there is a good recipe out there somewhere! This pie looks so good!!! 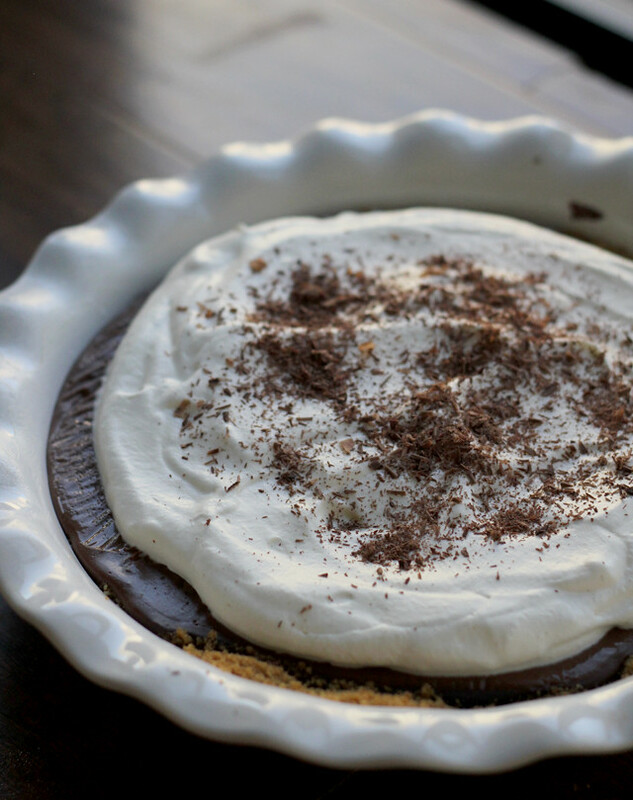 Chocolate pudding pie used to be one of my favorites, but I haven’t had it in so long! I used to use pudding mix, pre-made graham cracker crust & cool whip. I bet this version tastes 100x better! I love that this is from scratch! I used to make a lot of recipes with shortcuts (i.e., not from scratch 🙁 ), but now that I’ve been making things from scratch for the most part for a while now, it’s hard to go back. But I do remember how awesome that chocolate pudding pie my mom used to make (with boxed pudding) was….. Your version is waaaay better though, for sure! My favorite pie!! I could never pass up a slice of chocolate pudding pie. 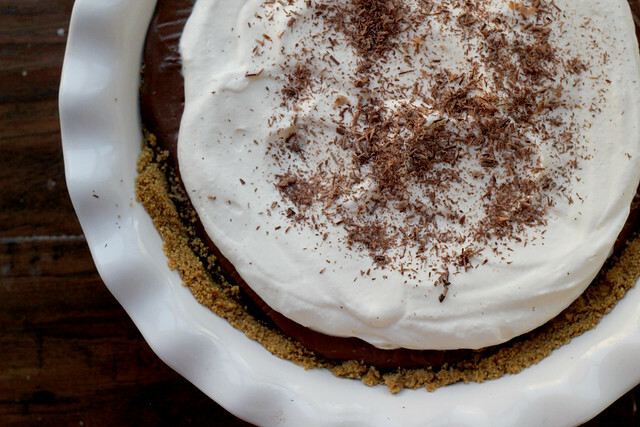 Because everything is better with chocolate and that includes pie. It’s so frustrating when things like that happened, but this looks like it was for the best! Now I’m going to return to hibernation because without pie week I have no need to exist. Just kidding, gotta make this pie first. Oh my goodness! Chocolate pudding pie! Probably one of my favorites and yours is gorgeous! 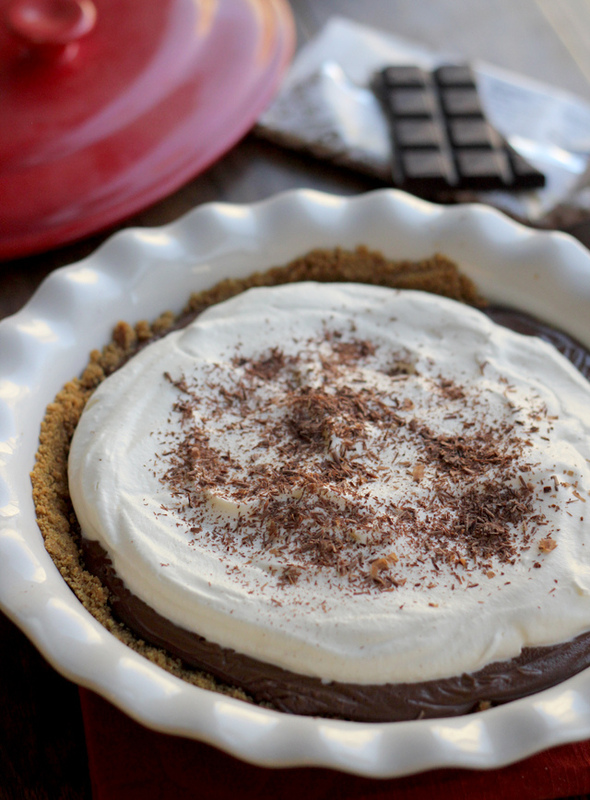 Chocolate pudding and buttery cookie crust…a heavenly combo, Joanne. Bummer when that happens – I hate throwing food away. Looks like you had a nice recovery though with this beautiful pie. I hadn’t ever heard of people eating this as a traditional dessert for the holidays until a few years ago. 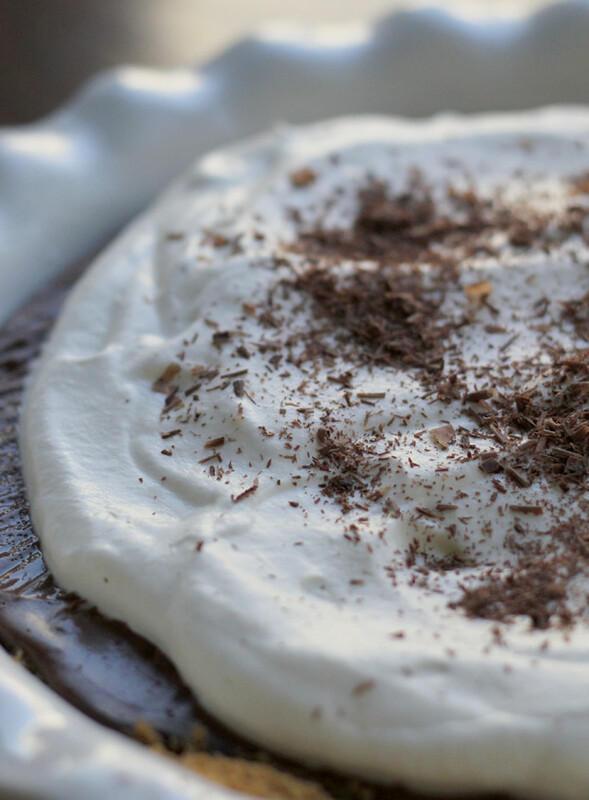 chocolate pudding pie is a perfect way to recover from such a disaster! I haven’t had this kind of pie in AGES, but may just make it for our Thanksgiving gathering just so I can enjoy homemade pudding. yummmmmmm! Well despite your setback you ended up with something chocolate at the end of the day so I’m happy! This pie is gorgeous, Joanne! And, I’m with you on homemade chocolate pudding. 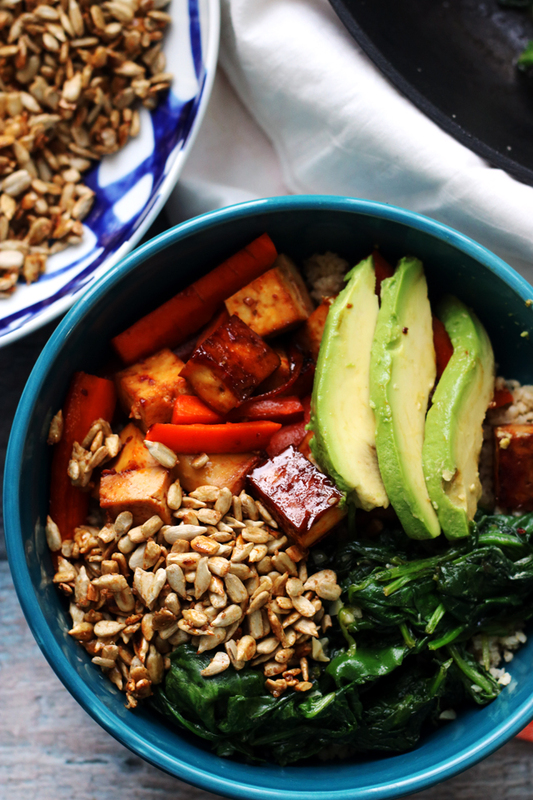 Not only is it super quick, it far surpasses the boxed stuff in flavor. Jeff’s mom always makes chocolate pudding pie for the holidays. I doubt I can get her to change her recipe, but the bittersweet chocolate in her sounds wonderful. I’ve done that condensed milk in a glass pan for something before… and it had to be in a water bath too I think. A huge pain! Sounds like the chocolate pudding pie was meant to be! Salted Caramel Pie sounds great – but how can you go wrong with a good old chocolate pudding pie? 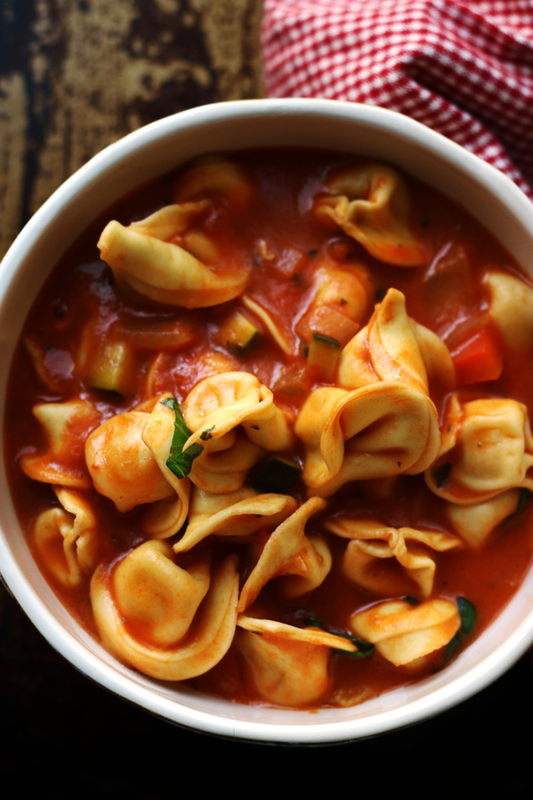 Once you start making things homemade you can never go back! I bet this pie tastes as good as it looks! I haven’t had this in ages!! But I bet this homemade version is nothing like the cafeteria one I used to enjoy in college. this is what i want on thanksgiving. a decadent chocolate pie. gahhh!!! I hate when I have kitchen blunders!! The worst. At least we ended up with this delicious pie, SO yummyyyy! What a pie! 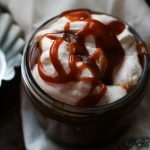 I’ve never had American-style chocolate pudding, from or packet or from scratch but it looks so comforting and easy! What magazine Joanne? What a bummer! Although you got this awesome pudding pie out of it! Are you going to bring it to Thanksgiving? I’d actually rather have a pudding pie, so this is perfect for me!! LOVE! Sadly, I have moved on to stretchy pant permanently or at least until further notice. I love that you’ve made chocolate pudding from scratch, Joanne. 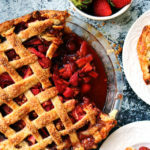 Fabulous pie! I haven’t had a pie like this for years – It looks so good! I’m so sad for the wasted sweetened condensed milk! Oh man. I am so sorry your first pie didn’t turn out. I can totally sympathize with kitchen disasters like this. But when an amazing chocolate pie like this is born from a disaster? It makes it kind of worth the suffering, right? This looks amazing. End of. This is the most gorgeous and decadent pie ever. Ok, I want to inhale this by myself. If I make it quick and eat it quick, no one will know it ever existed! You have spoilt me my friend, I will only want this pie now! If there’s chocolate in it I’m not complaining! YUM!! What a bummer! 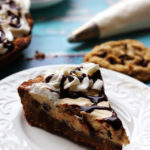 I think the chocolate pie looks beautiful and delicious! Oh Joanne… Chocolate pudding pie and pecan pie are my hubby’s two faves. I’m going to have to try out your recipe on him. He’ll be thrilled! Oh no, so it didn’t work? I pinned something to that method the other day. Phooey. But on the upside, you brought us this. It all evens out in the end. I’m just gonna go ahead and say I wanna face plant this pie. REEEEEEAL bad. Isn’t it amazing how trustworthy good old fashioned pudding is? My go-to when I have a baking disaster. Thank you for sharing sweet Joanne! I’ve seen the dish in the oven thing before. I’ve never tried it. However, I’ve done the can-fully-submerged-water-in-slow-cooker method. That worked for me. A great recovery from the waste of ingredients! This pie looks perfect. Salted caramel shmaramel. Chocolate pudding pie is always the answer. I don’t care what the question is. This looks divine my friend!!! Better than mama’s, I’d say! I kind of love old school box pudding desserts but this really does look and sound so much better. I am pretty sure I’d eat this pie with a spoon out of the pie dish… oops! Looks like your original fail turned into a big success. Joanne, I entered the Kitchen Aid food processor competition (I’m feeling lucky!) With Thanksgiving coming soon, I’ll have to get my separate “pie stomach” back into commission. I’ve set this part of my stomach aside to handle the pumpkin pie, chocolate pudding pie, (and is there such a thing as cranberry pie)? Woah this looks so good. Hoping to make it for thanksgiving!! Oh man, I’m sorry about your salted caramel pie. But really, this. Is. Amazing. Chocolate pudding pie, you will be in my dreams tonight. Homemade is SO much better than from the box. That pie looks absolutely amazing,Joanne! Great giveaway! I am trying not to eat as much pie over the holidays but this is not helping at all! Looks amazing! Oh wow what a pie!! I have never tried a pudding pie, but I definitely am craving yours. This looks fantastic! Quite often our disasters make for successes. Sure is the case here, Joanne. Looks like you a have the perfect pie for pie week…which is a cute idea in itself. Going to check out the recipes! Yum! Looks absolutely scrumptious. And, as always your photos make the food look so tempting. Joanne, this pie is a winner! was it a food and wine salted caramel pie? if so, i’ve made that a few times…haven’t had the caramel burning problem but I was definitely nervous re: the method. I recommend trying it again…it is so worth it!! I love chocolate pudding pie but never associated it with Thanksgiving until I moved to New England. We are invited to our friend’s home each year for this holiday. The mother of our hostess brings chocolate pudding pie each year but with one slice missing. She has the first slice at home and then brings the rest to her daughter’s home for all her guests on Thanksgiving day. 🙂 Yours sounds delicious with the graham cracker crust. Well all’s well that ends well, that’s for sure – because that is one gorgeous pie! Shane would *kill* for a slice! 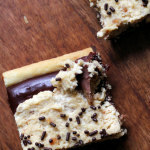 I have heard some people have luck with the oven dulce de leche method, but I’ve never tried. I have done it in the slow cooker though and had success! Sorry to hear about your other pie, but this one looks so yummy. I love chocolate pudding pies. Your chocolate pudding pie looks amazing! Wow! I love that you guys had a pie week. That’s so fun! My husband loved his mom’s chocolate pie from a box. He does not love mine from a box but likes it from scratch. What’s with that? Anyway, get this, just yesterday I promised him a chocolate pudding pie and a chocolate pudding pie he shall have. I guess I need to use your recipe since it conveniently placed itself in front of me. can we have a “chocolate pudding pie WEEK” every month? From November to January all I wear is stretchy pants so I’m all set : ) This pie looks so yummy! 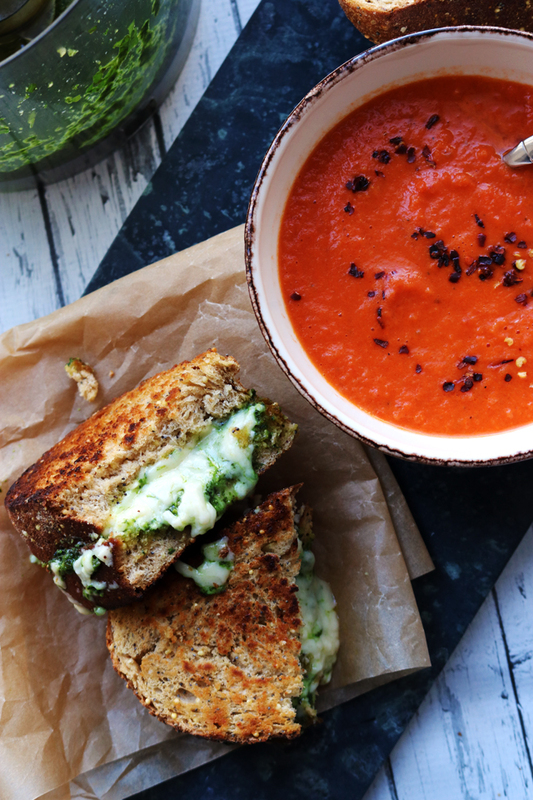 It’s a true classic and so much better when it’s homemade! ? This looks OUTRAGEOUS! I haven’t had pie like that in yeeeears. And I’m with ya – I’ve been telling myself to trust my gut more when cooking, EVEN when it’s something from a trusted source. If it doesn’t feel right, it probably isn’t. I’m sorry that was a fail! I’ve used that method before – I think I only baked mine for 1 hour. Anywho this pie sounds just as yummy! Homemade pudding rocks! I totally know what your pie fail is like. It happens all too often for me. I’m so glad you filled your pie crust with chocolate pudding, though! Such a great idea! Nest year… thanksgiving at your place! 😉 I want to slurp this pie UP! just made this recipe with a couple of minor adjustments: 3 oz of baker’s chocolate, flour and cornstarch used, mostly cornstarch and a bit more sugar at the end…added mini marshmallows too. OMG. soooo good! homemade pudding rocks! i will never buy jello brand again. Great pie! Just made it, but I didn’t see where I should add the half and half – did I miss this? Mine also came out tasting a bit gelatinous, do you have any suggestions to fix this? Oops! I’m so sorry, I should have made the instructions clearer. The half and half should be added with the milk in step 3. Did you end up adding it at all? If not, that could be why it tasted gelatinous. Otherwise, the only other thing I can think of is that maybe there was too much cornstarch added. Hope this helps!! Does this come out solid enough to use a cheesecake pan without crust lining the sides? Or will it ooze? I’m ashamed to say that I’ve never had chocolate pudding pie! 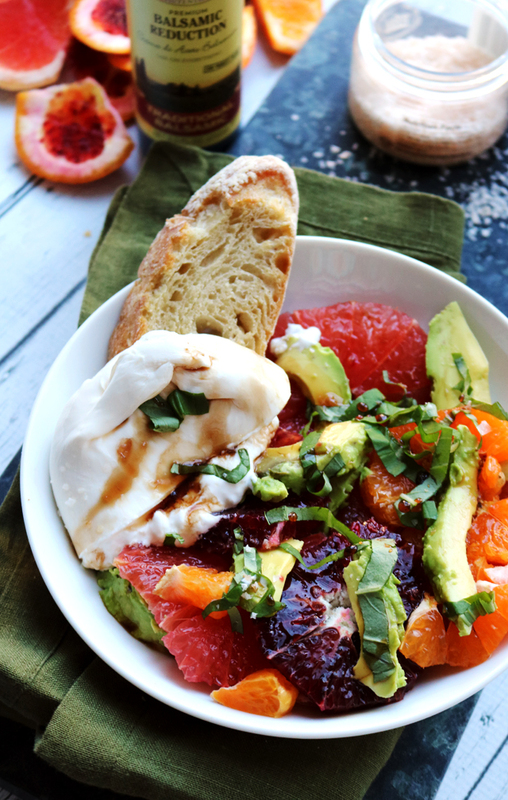 This recipe looks great though so hopefully that will change! Thanks for posting it, Joanne!